A special assembly was presented by the students of Grade 3 and Grade 4, on the occasion of Dussehra reiterating the ideology of good over evil and created a buzz amongst the children. The assembly was initiated by chanting the pious name of Lord Ram. This was followed by beseeching the Goddess by the reverberating sound of the school choir. The audience was briefed about the Demon Mahishasur and how Maa Durga was born in order to slay him. There was a scintillating dance performance, wherein the students presented a beautiful depiction of Ramayana in the form of Ramleela. The students of early years were simply awe struck to see their seniors on stage as Ram, Sita, Lakshman, Hanuman and Ravana. The certificates for various events were also given by the Principal. The assembly was conducted with total involvement, joy and love. No word can define a Mother, She’s the Angel sent from above! The day that celebrates the essence of a mother is Mothers’ Day. Mothers’ Day is something everyone can relate to. Keeping this special bonding in mind, we at DPS, Sector -84 had a special celebration on Mothers’ Day. The little ones danced and sang for their moms to welcome them and make them feel special. The moms as well as their children had a splendid time making a Chef Cap together. It was a pleasure watching the super excited moms with their dynamic and energetic children preparing unique and special dishes for the activity ‘Cooking without Fire’. The outcome of their efforts was marvellous. Later, they all shared their dishes and had a small party. Parent Engagement is an ongoing process that increases active participation, communication, and collaboration between parents, schools, and communities with the goal of educating the child and ensuring student achievement and success. DPS, Sector – 84 has created a Parent Engagement Program that involves families in meaningful ways and gives them an opportunity to be a part of their ward’s learning journey. Mother’s Day celebration was one such initiative. Welcome activities were carefully planned for our young ones to put them at ease and to ensure that they carry back small things created by them to show their proud parents. Nursery and KG students made welcome badges and table mats as expressions of their creativity. A great thought to teach the children of today. The more they experience and explore their ability to learn is stronger. 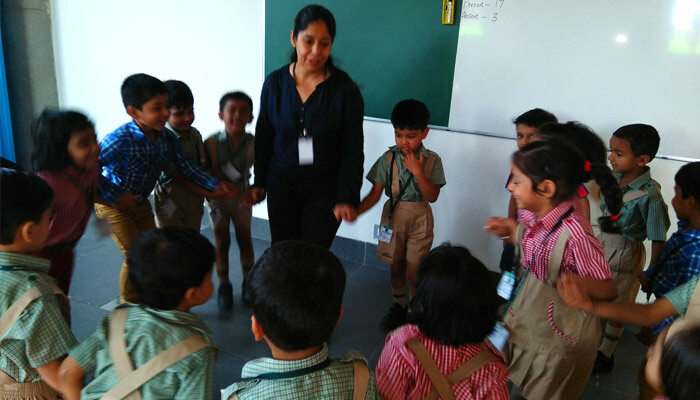 We at DPS, Sector – 84 firmly believe in Concept Based Teaching. It not only helps the child to be thorough with the topic, but he / she remembers it all through. 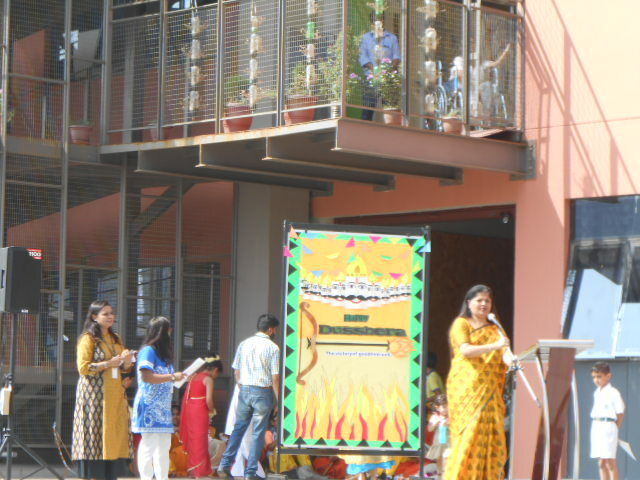 Various demonstrations happen within and outside the classrooms to prepare the students for future challenges. 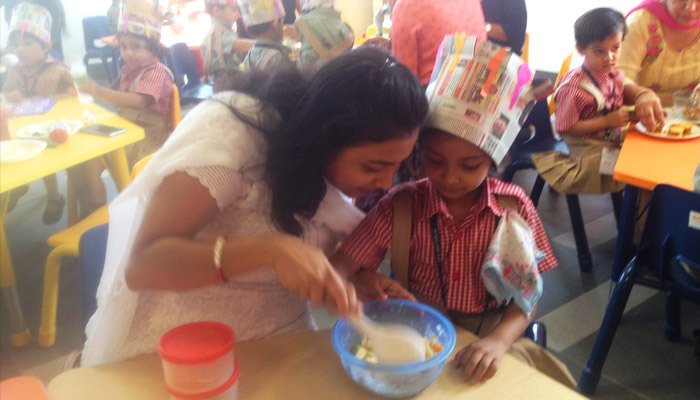 The students of Nursery and Kindergarten explored taste through ‘Lemonade / Roohafza activity’ and by tasting various foods to understand that different foods taste different. To explore the sense of smell, students smelled fruits like mango, banana, flower and perfume for fragrance, bad smell of stale fruit peels etc. To make learning more interesting, students planted saplings to learn more about how plants grow. To understand the basic concept of ‘What Comes After?’, the students played a game with number flash cards. The hands on activities proved to be a great source of learning.